The onset and escalation of World War II provided the rationale for most of Germany’s illegal human medical experimentation. Animal experimentation was known to be a poor substitute for experiments on humans. Since only analogous inferences could be drawn from animal experiments, the use of human experimentation during the war was deemed necessary to help in the German war effort. Applications for medical experimentation on humans were usually approved on the grounds that animal tests had taken the research only so far. Better results could be obtained by using humans in the medical experiments. Inmates at the Dachau Concentration Camp were subjected to medical experimentation involving malaria, high altitudes, freezing and other experiments. Such has been documented in the so-called Doctors’ Trial at Nuremberg, which opened on December 9, 1946, and ended on July 19, 1947. Also, Dr. Charles P. Larson, an American forensic pathologist, was at Dachau and conducted autopsies, interviews, and a review of the remaining medical records to determine the extent of the medical experimentation at the camp. The malaria experimentation at Dachau was performed by Dr. Klaus Karl Schilling, who was an internationally famous parasitologist. Dr. Schilling was ordered by Heinrich Himmler in 1936 to conduct medical research at Dachau for the purpose of immunizing individuals specifically against malaria. Dr. Schilling admitted to Dr. Larson that between 1936 and 1945 he inoculated some 2,000 prisoners with malaria. The medical supervisor at Dachau would select the people to be inoculated and then send this list of people to Berlin to be approved by a higher authority. Those who were chosen were then turned over to Dr. Schilling to conduct the medical experimentation. But my attempt to save Dr. Schilling’s life failed. Our High Command felt it had to make a public example of him – most of the other high-ranking Nazis connected with Dachau had already been executed – and made his wife watch the hanging. I did everything I could to stop it. I implored our military government not to pass sentence on him until he’d had a fair hearing, because I was just beginning to win his confidence, and get through to him. Looking back, I am sure that the execution of Dr. Schilling deprived the world of some very valuable scientific information – no matter how distasteful his research and experimentation may have been. The defense in the Doctors’ Trial at Nuremberg submitted evidence of doctors in the United States performing medical experiments on prison inmates and conscientious objectors during the war. The evidence showed that large-scale malaria experiments were performed on 800 American prisoners, many of them black, from federal penitentiaries in Atlanta and state penitentiaries in Illinois and New Jersey. U.S. doctors conducted human experiments with malaria tropica, one of the most dangerous of the malaria strains, to aid the U.S. war effort in Southeast Asia. Although Dr. Schilling’s malaria experiments were no more dangerous or illegal than the malaria experiments performed by U.S. doctors, Dr. Schilling had to atone for his malaria experiments by being hanged to death while his wife watched. The U.S. doctors who performed malaria experiments on humans were never charged with a crime. Germany also conducted high-altitude experiments at Dachau. Dr. Sigmund Rascher performed these experiments beginning February 22, 1942 and ending around the beginning of July 1942. The experiments were performed in order to know what happened to air crews after failure of, or ejection from, their pressurized cabins at very high altitudes. In this instance, airmen would be subjected within a few seconds to a drop in pressure and lack of oxygen. The experiments were performed to investigate various possible life-saving methods. To this end a low-pressure chamber was set up at Dachau to observe the reactions of a human being thrown out at extreme altitudes, and to investigate ways of rescuing him. The victims were locked in the chamber, and the pressure in the chamber was then lowered to a level corresponding to very high altitudes. The pressure could be very quickly altered, allowing Dr. Rascher to simulate the conditions which would be experienced by a pilot freefalling from altitude without oxygen. Dr. Rascher received authority to conduct these high-altitude experiments when he wrote to Heinrich Himmler and was told that prisoners would be placed at his disposal. Dr. Rascher stated in his letter that he knew the experiments could have fatal results. According to Walter Neff, the prisoner who gave testimony at the Doctors’ Trial, approximately 180 to 200 prisoners were used in the high-altitude experiments. Approximately 10 of these prisoners were volunteers, and about 40 of the prisoners were men not condemned to death. According to Neff’s testimony, approximately 70 to 80 prisoners died during these experiments. A film showing the complete sequence of an experiment, including the autopsy, was discovered in Dr. Rascher’s house at Dachau after the war. Dr. Rascher also conducted freezing experiments at Dachau after the high-altitude experiments were concluded. These freezing experiments were conducted from August 1942 to approximately May 1943. The purpose of these experiments was to determine the best way of warming German pilots who had been forced down in the North Sea and suffered hypothermia. Dr. Rascher’s subjects were forced to remain outdoors naked in freezing weather for up to 14 hours, or the victims were kept in a tank of ice water for three hours. Their pulse and internal temperature were measured through a series of electrodes. Warming of the victims was then attempted by different methods, most usually and successfully by immersion in very hot water. It is estimated that these experiments caused the deaths of 80 to 90 prisoners. Dr. Rascher also experimented with the effects of Polygal, a substance made from beet and apple pectin, which aided blood clotting. He predicted that the preventive use of Polygal tablets would reduce bleeding from surgery and from gunshot wounds sustained during combat. Subjects were given a Polygal tablet and were either shot through the neck or chest, or their limbs were amputated without anesthesia. Dr. Rascher published an article on his use of Polygal without detailing the nature of the human trials. Dr. Rascher also set up a company staffed by prisoners to manufacture the substance. Dr. Rascher’s nephew, a Hamburg doctor, testified under oath that he knew of four prisoners who died from Dr. Rascher’s testing Polygal at Dachau. Phlegmons were also induced in inmates at Dachau by intravenous and intramuscular injection of pus during 1942 and 1943. Various natural, allopathic and biochemical remedies were then tried to cure the resulting infections. The phlegmon experiments were apparently an attempt by National Socialist Germany to find an antibiotic similar to penicillin for infection. All of the doctors who took part in these phlegmon experiments were dead or had disappeared at the time of the Doctors’ Trial. The only information about the number of prisoners used and the number of victims was provided by an inmate nurse, Heinrich Stöhr, who was a political prisoner at Dachau. Stöhr stated that seven out of a group of 10 German subjects died in one experiment, and that in another experiment 12 out of a group of 40 clergy died. Official documents and personal testimonies indicate that physicians at Dachau performed many liver biopsies when they were not needed. Dr. Rudolf Brachtl performed liver biopsies on healthy people and on people who had diseases of the stomach and gall bladder. While biopsy of the liver is an accepted and frequently used diagnostic procedure, it should only be performed when definite indications exist and other methods fail. Some physicians at Dachau performed liver biopsies simply to gain experience with its techniques. These Dachau biopsies violated professional standards since they were often conducted in the absence of genuine medical indication. Dr. Charles Larson’s forensic work at Dachau indicated that only a small percentage of the deaths at Dachau were due to medical experimentation on humans. His autopsies showed that most of the victims died from natural causes; that is, of disease brought on by malnutrition and filth caused by wartime conditions. 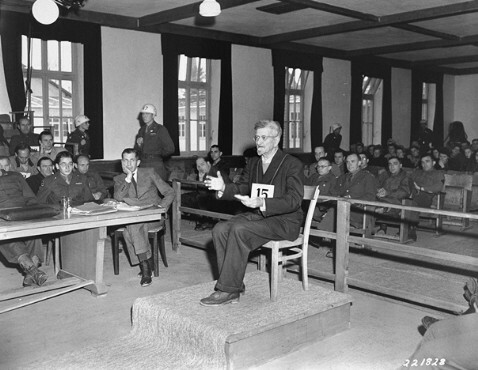 In his depositions to Army lawyers, Dr. Larson made it clear that one could not indict the whole German people for the National Socialist medical crimes. Dr. Larson sincerely believed that although Dachau was only a short ride from Munich, most of the people in Munich had no idea what was going on inside Dachau. The increase in deaths at Dachau was caused primarily by a devastating typhus epidemic which, in spite of the efforts made by the medical staff, continued to spread throughout Dachau during the final seven months of the war. The number of deaths at Dachau also includes 2,226 people who died in May 1945 after the Allies had liberated the camp, as well as the deaths of 223 prisoners in March 1944 from Allied aerial attacks on work parties. Thus, while illegal medical experiments were conducted on prisoners at Dachau, Berben’s book clearly shows that the overwhelming majority of deaths of prisoners at Dachau were from natural causes. Dr. Karl Brandt and the other defendants were infuriated during the Doctors’ Trial at the moral high ground taken by the U.S. prosecution. Evidence showed that the Allies had been engaged in illegal medical experimentation, including poison experiments on condemned prisoners in other countries, and cholera and plague experiments on children. Dr. Bettina Blome, the wife of the defendant Dr. Kurt Blome, meticulously researched experiments that were conducted by the U.S. Office of Scientific Research and Development (OSRD) during the war. In addition to malaria experiments on Terre Haute Federal Prison inmates, she also uncovered Dr. Walter Reed’s 19th-century yellow fever research for the U.S. Army, in which volunteer human test subjects had died. Blome’s research was entered into evidence at the Doctors’ Trial. Servatius had located a Life magazine article, published in June of 1945, that described how OSRD conducted experiments on 800 U.S. prisoners during the war. Servatius read the entire article, word for word, in the courtroom. None of the American judges was familiar with the article, nor were most members of the prosecution, and its presentation in court clearly caught the Americans off guard. Because the article specifically discussed U.S. Army wartime experiments on prisoners, it was incredibly damaging for the prosecution. “Prison life is ideal for controlled laboratory work with humans,” Servatius read, quoting American doctors who had been interviewed by Life reporters. The idea that extraordinary times call for extraordinary measures, and that both nations had used human test subjects during war, was unsettling. It pushed the core Nazi concept of the Untermenschen to the side. The Nuremberg prosecutors were left looking like hypocrites. The U.S. prosecution flew in Dr. Andrew Ivy to explain the differences in medical ethics between German and U.S. medical experiments. Interestingly, Dr. Ivy himself had been involved in malaria experiments on inmates at the Illinois State Penitentiary. When Dr. Ivy mentioned that the United States had specific research standards for medical experimentation on humans, it turned out that these principles were first published on December 28, 1946. Dr. Ivy had to admit that the U.S. principles on medical ethics in human experimentation had been made in anticipation of Dr. Ivy’s testimony at the Doctors’ Trial. 1] Kater, Michael H., Doctors under Hitler, Chapel Hill: The University of North Carolina Press, 1989, p. 226. McCallum, John Dennis, Crime Doctor, Mercer Island, Wash.: The Writing Works, Inc., 1978, pp. 64-65. McCallum, John Dennis, Crime Doctor, Mercer Island, Wash.: The Writing Works, Inc., 1978, pp. 66-67. Spitz, Vivien, Doctors from Hell: The Horrific Account of Nazi Experiments on Humans, Boulder, Colo.: Sentient Publications, 2005, p. 74. Spitz, Vivien, Doctors from Hell: The Horrific Account of Nazi Experiments on Humans, Boulder, Colo.: Sentient Publications, 2005, p. 85. McCallum, John Dennis, Crime Doctor, Mercer Island, Wash.: The Writing Works, Inc., 1978, pp. 67-68. Michalczyk, John J., Medicine, Ethics, and the Third Reich: Historical and Contemporary Issues, Kansas City, Mo. : Sheed & Ward, 1994, p. 96. Ibid., p. 134. See also Michalczyk, John J., Medicine, Ethics, and the Third Reich: Historical and Contemporary Issues, Kansas City, Mo. : Sheed & Ward, 1994, p. 97. Spitz, Vivien, Doctors from Hell: The Horrific Account of Nazi Experiments on Humans, Boulder, Colo.: Sentient Publications, 2005, p. 173. McCallum, John Dennis, Crime Doctor, Mercer Island, Wash.: The Writing Works, Inc., 1978, p. 69. Berben, Paul, Dachau, 1933-1945, The Official History, London: The Norfolk Press, 1975, p. 19. Jacobsen, Annie, Operation Paperclip: The Secret Intelligence Program that Brought Nazi Scientists to America, New York: Little, Brown and Company, 2014, pp. 273-274.